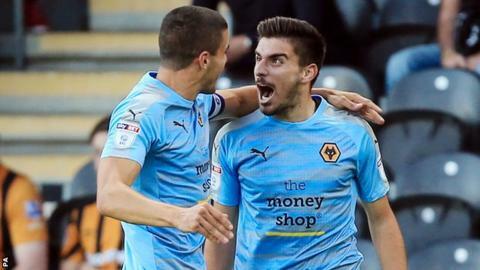 Championship-record signing Ruben Neves scored a stunning first goal for Wolves as Wanderers continued their 100% start to the season by winning at Hull City. Neves, a £15.8m buy from Porto in July, found the top corner from 30 yards to give the visitors an early advantage. Hull captain Michael Dawson nodded in from close range to equalise, but Diogo Jota turned in Bright Enobakhare's cross to restore Wolves' lead. Nouha Dicko sent Hull to a first defeat, despite David Meyler's penalty. Fraizer Campbell and Abel Hernandez had their best chances to equalise with the score at 2-1, but Campbell was denied by John Ruddy when one-on-one with the Wolves goalkeeper and the latter headed against a post from a corner. But they were undone by two first-half goals of high quality from Wolves and a third on the counter attack from substitute Dicko. Like fellow Portuguese 20-year-old Neves, on-loan Atletico Madrid forward Jota also scored in English football for the first time, his goal coming after excellent work on the right wing by teenager Enobakhare. Wolves' defence was breached for the first time this season, having gone into the match as the only EFL club not to have let in a goal in a competitive game in 2017-18. Despite the first-half concession to Dawson and Meyler's spot-kick in the ninth minute of stoppage time, they are one of three Championship teams to have won their first three league matches of the campaign. "It is very important to keep a player like Sam Clucas because he is a leader. "We spoke with him about his situation but he's a really very professional guy and he has a long-term contract with the club. "We built the team in a very difficult time. One more out can break the whole team, I'm very nervous about the situation." "It was a good result. Parts of the performance went well but other parts not so well. We conceded from set-pieces. "John Ruddy made a very good save but we have to work hard on set-pieces and not concede a goal from set-pieces. "The good start to the season shows the hard work that the boys did from day one, the way they prepared themselves for the challenge." Match ends, Hull City 2, Wolverhampton Wanderers 3. Second Half ends, Hull City 2, Wolverhampton Wanderers 3. Foul by Sebastian Larsson (Hull City). Goal! Hull City 2, Wolverhampton Wanderers 3. David Meyler (Hull City) converts the penalty with a right footed shot to the bottom left corner. Penalty conceded by Conor Coady (Wolverhampton Wanderers) after a foul in the penalty area. Penalty Hull City. Adama Diomande draws a foul in the penalty area. Attempt blocked. Kamil Grosicki (Hull City) header from outside the box is blocked. Assisted by Adama Diomande. Ivan Cavaleiro (Wolverhampton Wanderers) is shown the yellow card for a bad foul. Michael Dawson (Hull City) is shown the yellow card. Attempt missed. Max Clark (Hull City) left footed shot from outside the box is high and wide to the left. Sam Clucas (Hull City) wins a free kick on the left wing. Goal! Hull City 1, Wolverhampton Wanderers 3. Nouha Dicko (Wolverhampton Wanderers) left footed shot from the centre of the box to the centre of the goal. Assisted by Ivan Cavaleiro with a through ball following a fast break. Attempt missed. Nouha Dicko (Wolverhampton Wanderers) header from the right side of the six yard box misses to the right. Assisted by Barry Douglas with a cross following a corner. Corner, Wolverhampton Wanderers. Conceded by Ola Aina. Substitution, Hull City. David Meyler replaces Abel Hernández because of an injury. Substitution, Wolverhampton Wanderers. Ryan Bennett replaces Diogo Jota. Delay in match Abel Hernández (Hull City) because of an injury. Corner, Hull City. Conceded by Willy Boly. Attempt missed. Kamil Grosicki (Hull City) header from the centre of the box misses to the left. Assisted by Ola Aina with a cross. Offside, Wolverhampton Wanderers. Ivan Cavaleiro tries a through ball, but Nouha Dicko is caught offside. Substitution, Hull City. Adama Diomande replaces Fraizer Campbell. Substitution, Wolverhampton Wanderers. Nouha Dicko replaces Léo Bonatini. Attempt blocked. Ivan Cavaleiro (Wolverhampton Wanderers) right footed shot from outside the box is blocked. Assisted by Matt Doherty. Attempt blocked. Kamil Grosicki (Hull City) right footed shot from outside the box is blocked. Assisted by Sebastian Larsson. Attempt missed. Abel Hernández (Hull City) right footed shot from the centre of the box misses to the left. Assisted by Ola Aina with a cross. Hand ball by Fraizer Campbell (Hull City). Abel Hernández (Hull City) hits the left post with a header from very close range. Assisted by Sam Clucas with a cross following a corner. Corner, Hull City. Conceded by Conor Coady.